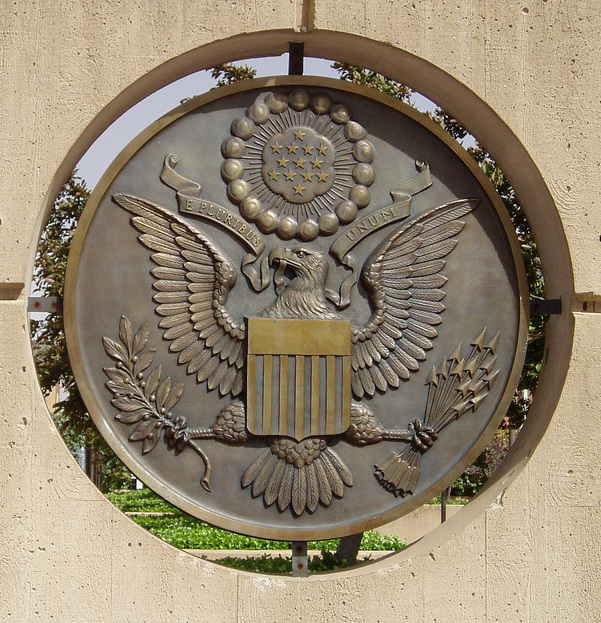 Representation of the great seal of the United States at the Oklahoma City National Monument; photo by Cosmo Spacely (theunabonger) on Flickr (noncommercial use permitted with attribution / no derivative works). The United States seal has a rich history beginning with our founding fathers in 1776 when the first Continental Congress resolved that Dr. Franklin, Mr. Jefferson, and J. Adams "bring in a device for a seal for the United States of America." Both sides of the Great Seal can be seen on the back of a U.S. one-dollar bill. On July 4, 1776, Benjamin Franklin, John Adams, and Thomas Jefferson were given the task of creating a seal for the 13 United States of America. The delegates of the Constitutional Convention believed an emblem and national coat of arms would be evidence of an independent nation and a free people with high aspirations and grand hopes for the future. The Great Seal was finalized and approved six years later on June 20, 1782. The symbols on the seal reflect the beliefs and values that the Founding Fathers wanted to pass on to their descendants. Eagle: In the center of the seal is a bald eagle (our national bird). The eagle holds a scroll in its beak inscribed with our original national motto: "E Pluribus Unum," which is Latin for "one from many" or "one from many parts" (one nation created from 13 colonies). The eagle grasps an olive branch in its right talon and a bundle of thirteen arrows in its left. The olive branch and arrows are symbols for the power of peace and war. Shield: A shield with thirteen red and white stripes covers the eagle's breast. 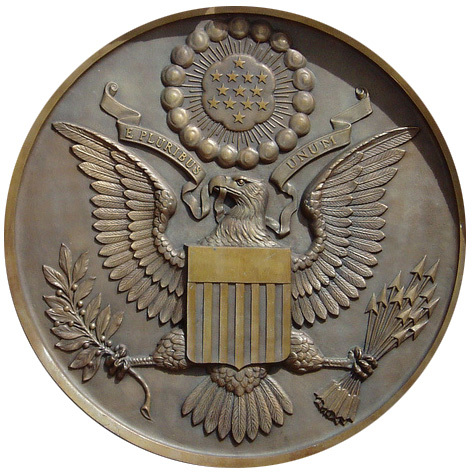 The shield is supported solely by the American eagle as a symbol that Americans rely on their own virtue. Cloud: Above the eagle's head is a cloud surrounding a blue field containing thirteen stars which form a constellation. The constellation denotes that a new State is taking its place among other nations. Pyramid: The seal's reverse side contains a 13-step pyramid with the year 1776 in Roman numerals at the base (the year independence was declared). 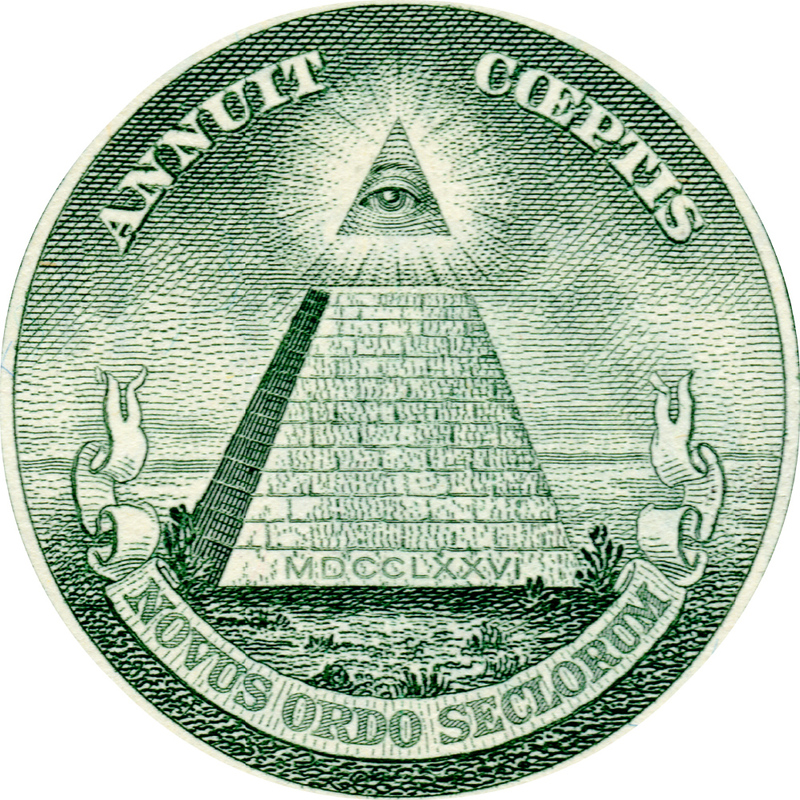 Eye: At the top of the pyramid is the Eye of Providence with the Latin motto "Annuit Coeptis" in the sky above - meaning "It [the Eye of Providence] is favorable to our undertakings" or "He favors our undertakings." Scroll: Below the pyramid, a scroll reads "Novus Ordo Seclorum" - Latin for "New Order of the Ages." which refers to 1776 as the beginning of the American new era. Great seal of the United States located at the Oklahoma City National Monument; photo by Cosmo Spacely (theunabonger) on Flickr (noncommercial use permitted with attribution / share alike). 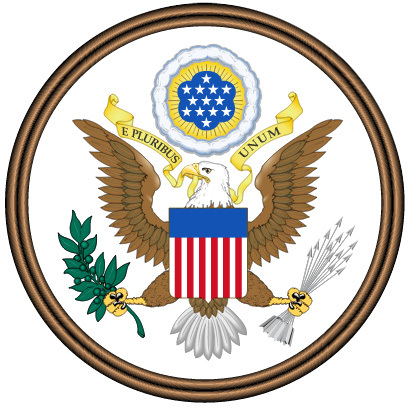 Great Seal of the United States of America; obverse (front); public domain image on Wikipedia. Reverse of U.S. dollar bill; features the obverse and reverse of the Great Seal. Photo by Frank Boston/Flickr (use permitted with attribution). 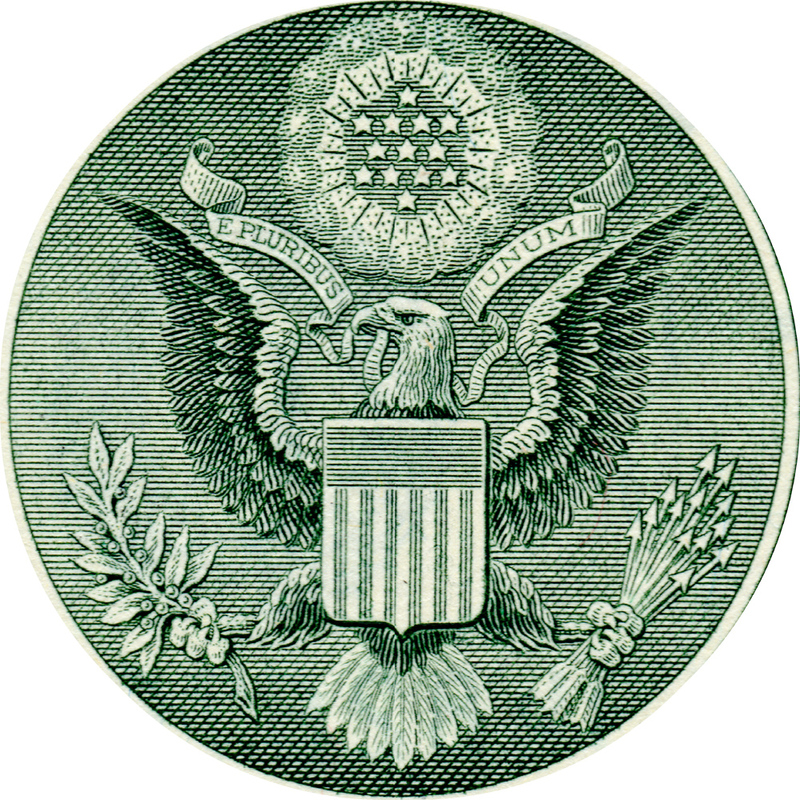 Obverse of Great Seal on dollar bill; the U.S. dollar bill also features the reverse of the Great Seal. Photo by Frank Boston/Flickr (use permitted with attribution). Reverse of Great Seal on U.S. dollar bill; the obverse, or main face of the seal, is also displayed on the dollar bill. Photo by Frank Boston/Flickr (use permitted with attribution).